ONE: Prepare the loofah sponge. Bramble Berry’s loofah is flat until it’s dunked in water, then it softens and expands. We find that the sponges are easier to cut once they have expanded, as they are softer and it’s easier to see their shape. 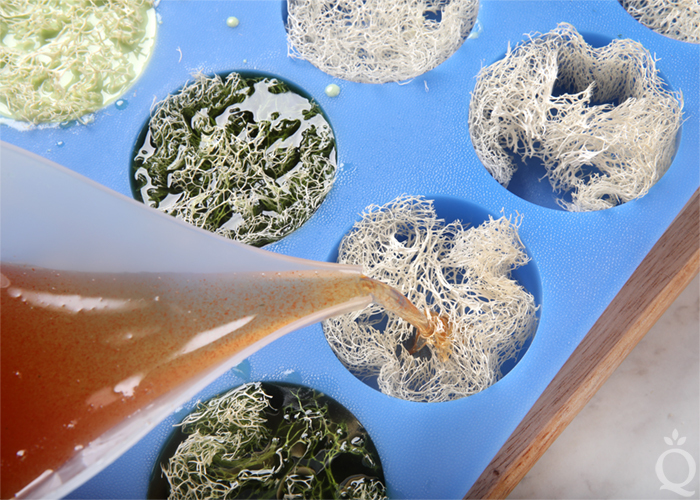 Dunk the loofah sponges in water until they expand. 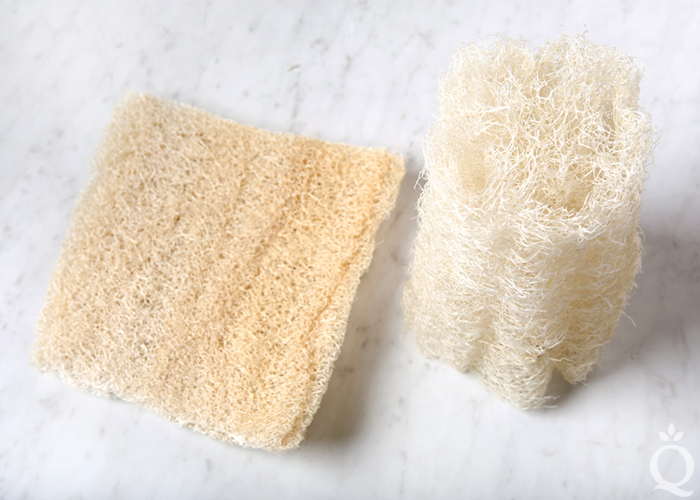 Because they are a natural product, some loofah sponges are larger than others. TWO: Squeeze out any excess water. Using a sharp pair of scissors, cut the loofah into round shapes. It helps to tightly squeeze the sponge to make it more compact while cutting. Try your best to cut the loofah so it’s slightly taller than the depth of the silicone mold cavities. TIP: If you cut it a little too thin, place a small piece of loofah into the mold cavity and set the thin loofah piece on top. This will help lift the loofah up so the soap doesn’t completely cover it. THREE: Place each round into a mold cavity. If the loofah sponge is large, you may want to cut it in half. Place the mold on a cutting board and set aside. FOUR: Chop 32 ounces of Clear Melt and Pour Soap Base and 16 ounces of White Melt and Pour Soap Base into small uniform pieces. 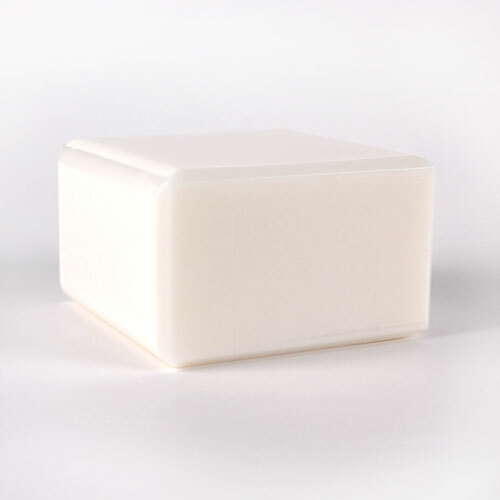 Place all of the white soap into a heat-safe container. 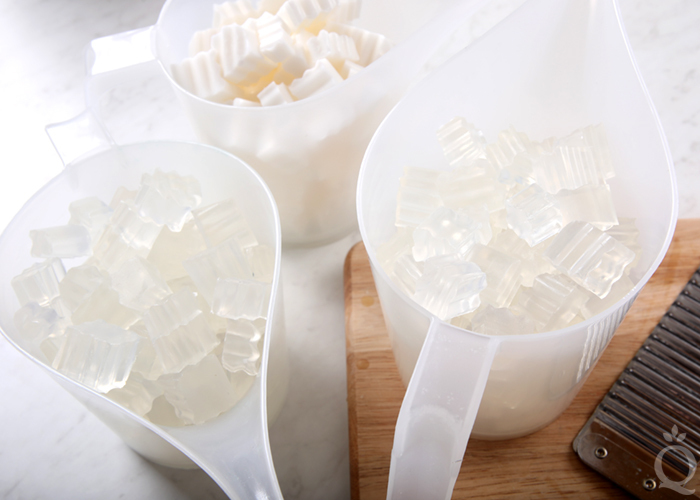 Split the Clear Melt and Pour Soap Base into two heat-safe containers – each should contain 16 ounces. FIVE: In separate containers, disperse 1 teaspoon of spinach powder into 1 tablespoon of 99% isopropyl alcohol and 2 teaspoons of tomato powder into 2 tablespoons of 99% isopropyl alcohol. Mix together. Dispersing the colorants helps prevent clumps. 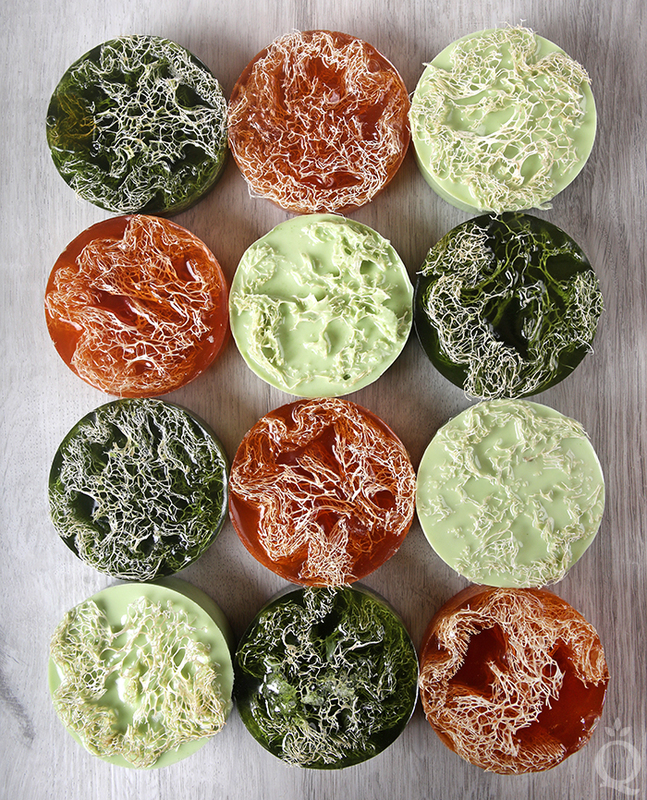 SIX: Melt each container of melt and pour soap using 30 second bursts, stirring in between each one. 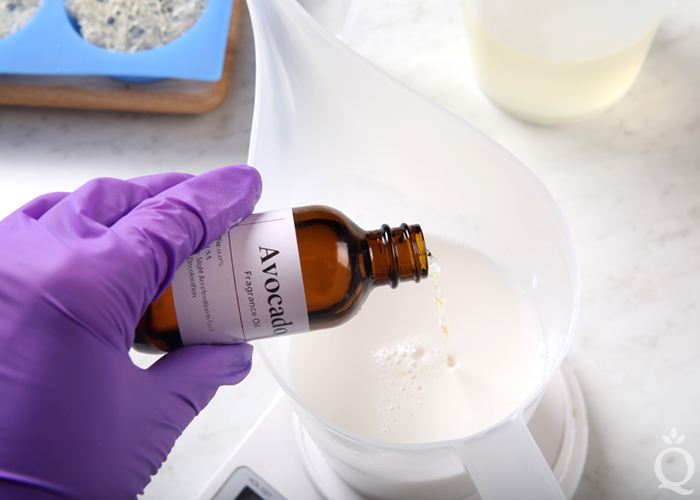 Once they are all completely melted, add 0.3 ounces of Avocado Fragrance Oil to each container and mix in thoroughly. SEVEN: To the melted white soap, add 1.5 teaspoons of dispersed spinach powder. Then, add 1.5 teaspoons of dispersed spinach powder to one of the containers of melted clear soap. Finally, add all of the dispersed tomato powder to the last container of melted clear soap. Thoroughly mix in all of the additives. EIGHT: Pour each color of soap into 4 cavities of the mold. Each cavity will be filled to the very top. After each pour, spritz the soap with 99% isopropyl alcohol to help get rid of bubbles. TIP: The tomato powder tends to fall to the bottom if the soap is too hot and thin. To prevent this, pour the soap once it has cooled to about 120-125° F.
NINE: Allow the soap to cool and harden for several hours, up to overnight. Once they have cooled and hardened, remove them from the mold and enjoy. To help prevent glycerin dew, wrap the soap in plastic wrap. 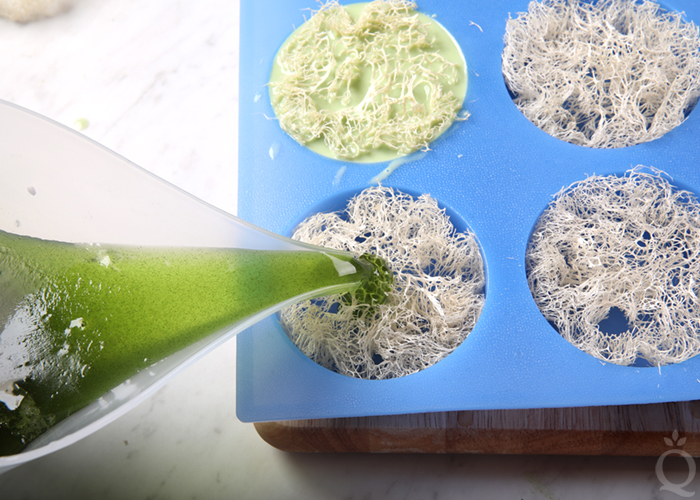 These bars are made with natural loofah sponges, tomato powder, and spinach powder. They cleanse and exfoliate at the same time. Prepare the loofah sponge. Bramble Berry’s loofah is flat until it’s dunked in water, then it softens and expands. 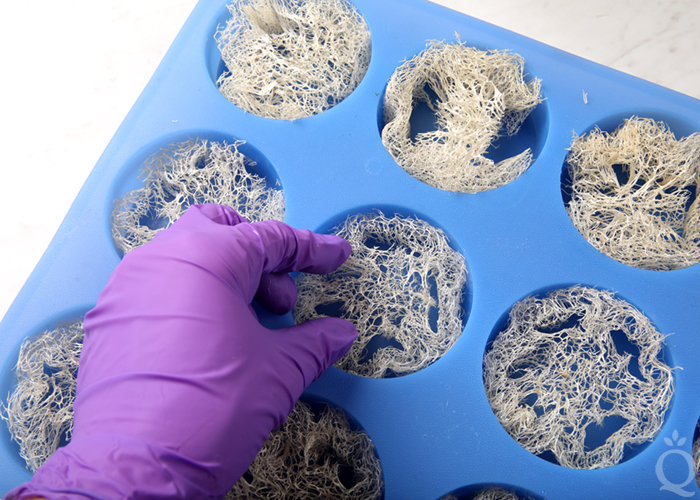 We find that the sponges are easier to cut once they have expanded, as they are softer and it’s easier to see their shape. Dunk the loofah sponges in water until they expand. Because they are a natural product, some loofah sponges are larger than others. Squeeze out any excess water. 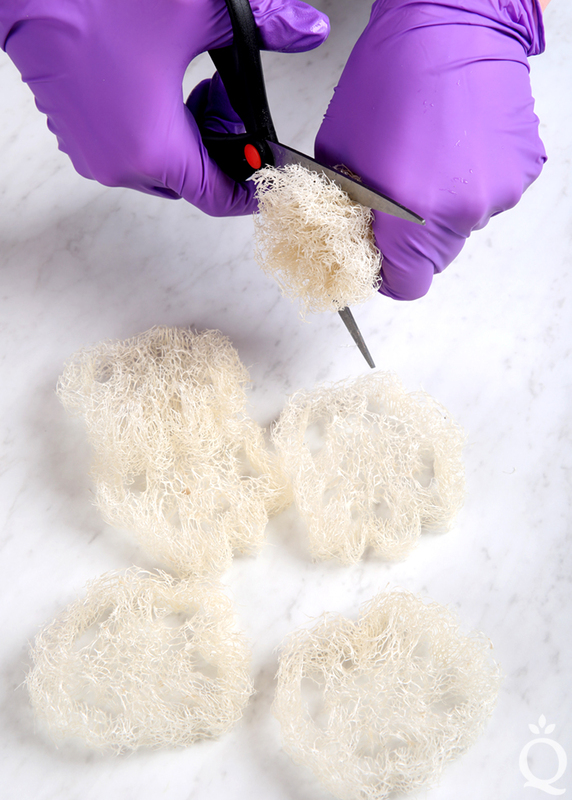 Using a sharp pair of scissors, cut the loofah into round shapes. It helps to tightly squeeze the sponge to make it more compact while cutting. 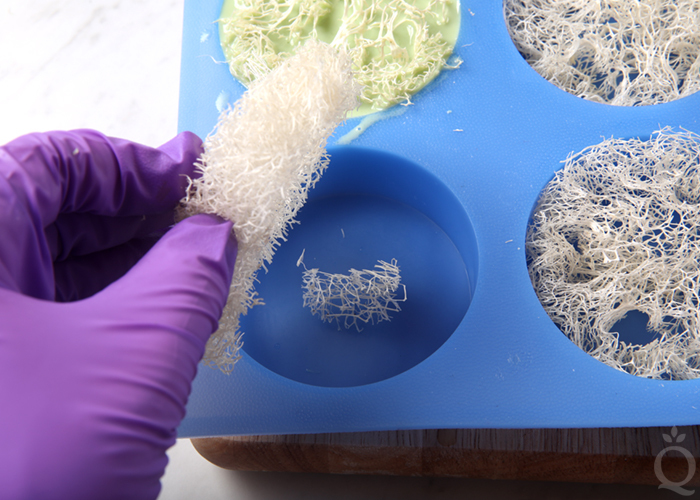 Try your best to cut the loofah so it’s slightly taller than the depth of the silicone mold cavities. TIP: If you cut it a little too thin, place a small piece of loofah into the mold cavity and set the thin loofah piece on top. This will help lift the loofah up so the soap doesn’t completely cover it. Place each round into a mold cavity. If the loofah sponge is large, you may want to cut it in half. Place the mold on a cutting board and set aside. Chop 32 ounces of Clear Melt and Pour Soap Base and 16 ounces of White Melt and Pour Soap Base into small uniform pieces. Place all of the white soap into a heat-safe container. 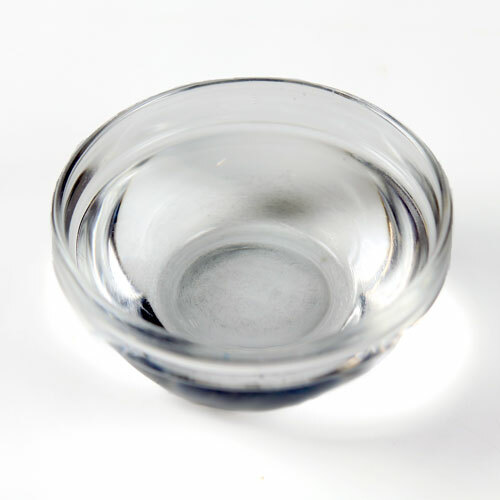 Split the Clear Melt and Pour Soap Base into two heat-safe containers – each should contain 16 ounces. 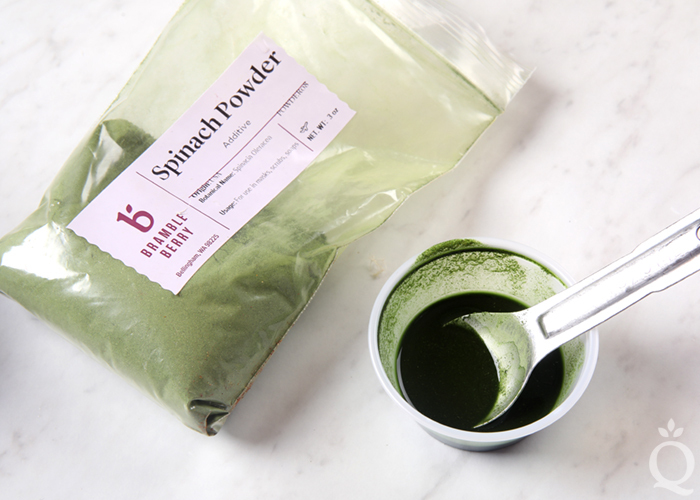 In separate containers, disperse 1 teaspoon of spinach powder into 1 tablespoon of 99% isopropyl alcohol and 2 teaspoons of tomato powder into 2 tablespoons of 99% isopropyl alcohol. Mix together. Dispersing the colorants helps prevent clumps. Melt each container of melt and pour soap using 30 second bursts, stirring in between each one. 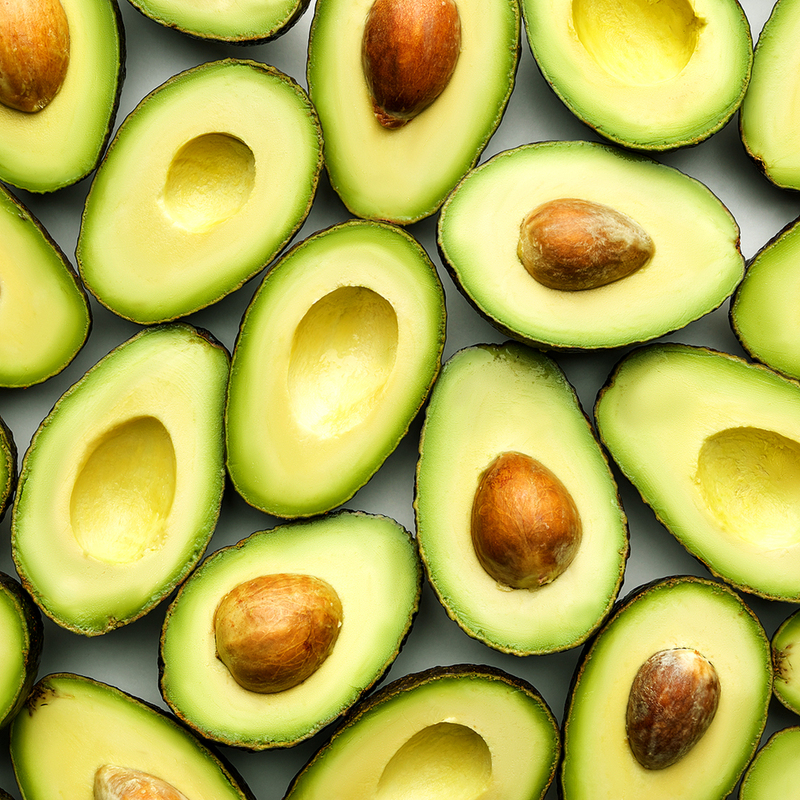 Once they are all completely melted, add 0.3 ounces of Avocado Fragrance Oil to each container and mix in thoroughly. 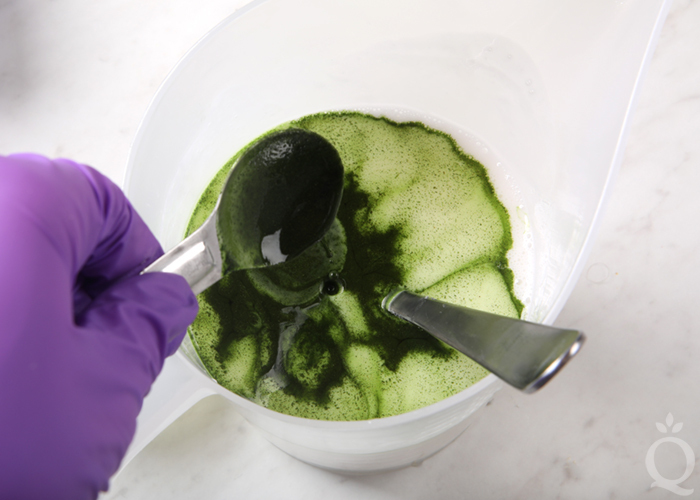 To the melted white soap, add 1.5 teaspoons of dispersed spinach powder. Then, add 1.5 teaspoons of dispersed spinach powder to one of the containers of melted clear soap. Finally, add all of the dispersed tomato powder to the last container of melted clear soap. Thoroughly mix in all of the additives. our each color of soap into 4 cavities of the mold. Each cavity will be filled to the very top. 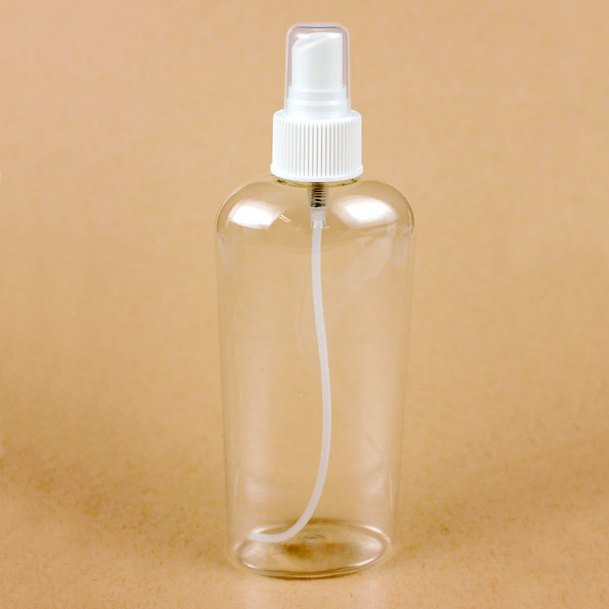 After each pour, spritz the soap with 99% isopropyl alcohol to help get rid of bubbles. 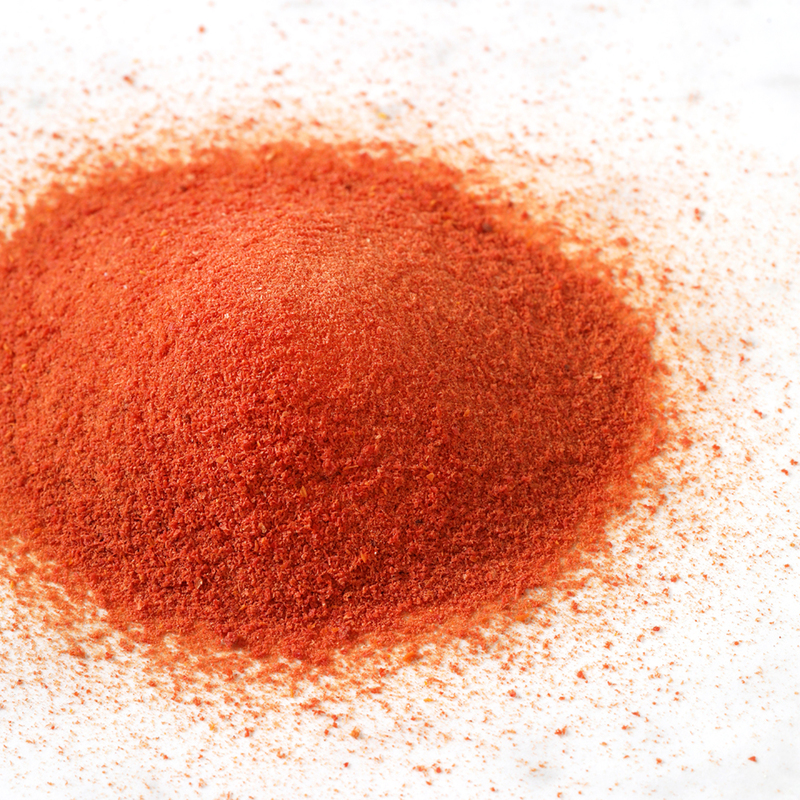 TIP: The tomato powder tends to fall to the bottom if the soap is too hot and thin. To prevent this, pour the soap once it has cooled to about 120-125° F.
Allow the soap to cool and harden for several hours, up to overnight. Once they have cooled and hardened, remove them from the mold and enjoy. 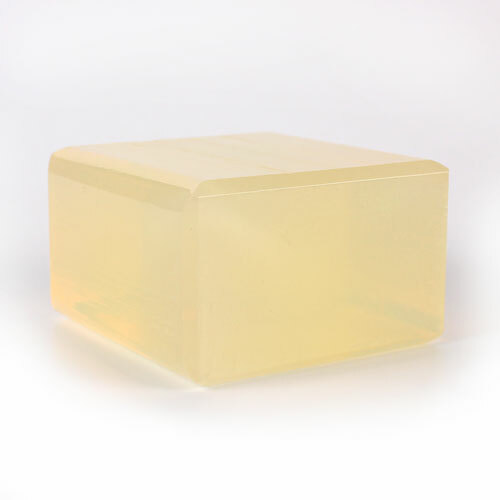 To help prevent glycerin dew, wrap the soap in plastic wrap. Hi! Your Add to Cart Button doesn’t work. Love the recipe, can’t wait to try! Yes, it is part of the new website update and we are working on fixing them now. Sorry about the trouble! I just made these and after three days, the soaps with the tomato powder grew white spots all through the inside only. It does not appear to be glycerin dew because there is no sweat or anything else on the outside of the soap, just these white spots throughout the inside. The soap is wrapped tightly in saran wrap. I followed the recipe exactly and did not add anything else. This only happened to the tomato ones and not the spinach ones. Any ideas? Is this mold from the tomato powder? What else could it be? The pH level of soap doesn’t allow for bacterial growth, so it’s doubtful that you’ve encountered mold. Those spots may be from powder that wasn’t fully dispersed. 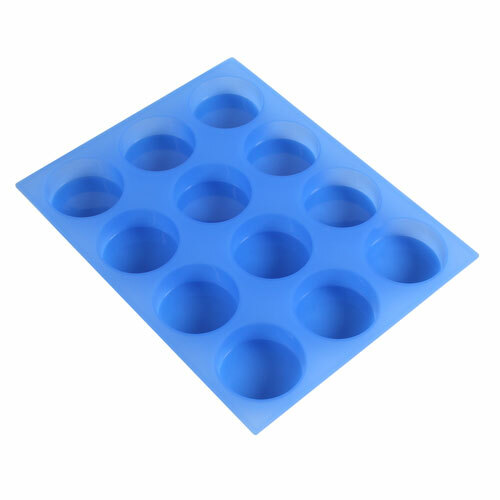 Can you clarify if other melt and pour soaps can be used? Specifically, goat milk melt and pour. Thank you! You can use different melt and pour soaps in this recipe, that will just change the final color. If you use the Goat Milk soap it will make your colors more similar to the pastel and creamy White MP bars. Glad you like this tutorial! amazing post thanks fore the share. Thanks, Ayesha. We are glad you like this post. It means a lot to us! I have been following your channel on YouTube and I am excited about the fascinating soaps here on your site. I have tried one of your recipes and will like to start my soap . business but I am interested in melt and pour. My concern is that I live in Africa where temperatures are always very high. Will it be advisable to opt for melt and pour? Melt and pour can sweat in hot and humid climates. It helps to wrap the bars tightly with plastic wrap and store them in a cool, dry place. If you have a dehumidifier or a fan you can use it to keep the bars fresh. Soaking the loofah in water first – will this introduce mould in the soap later? Soap has a pH level that doesn’t allow mold to grow, so it’s not likely. 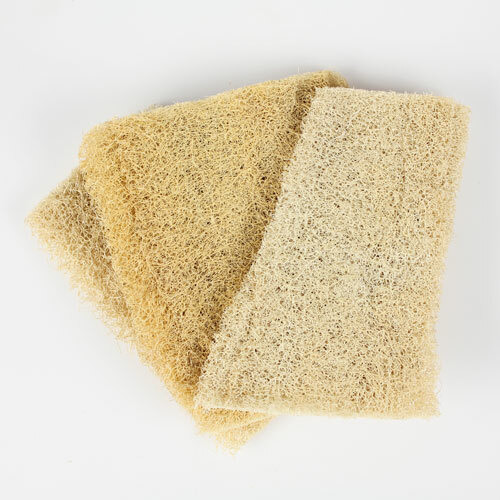 To be extra careful, lay the loofah on a dry towel after it’s cut so any leftover evaporates. Then you can put it in the mold. I have a query regarding this spinach and tomato powder recipe. Won’t the soaps turn brown after few months? Or will they retain the same color effect after months? Please clarify. You’re welcome, glad you’re enjoying the recipe. 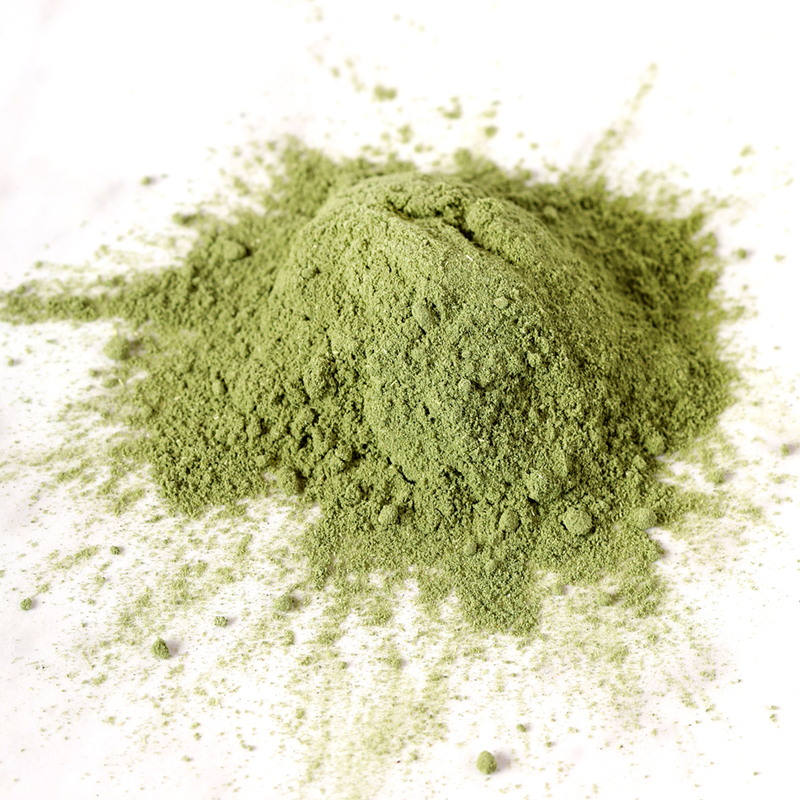 The spinach and tomato powder are natural colorants, so they can fade over time. You can make the color more vibrant and long lasting with a mica. I’ll link some good options below. Then, store the soap out of direct sunlight. Ladies ..A+..100 on these..Amazingly beautiful and well as usefull,it’s garden season! Thanks Karen, that means a lot to us. Enjoy! 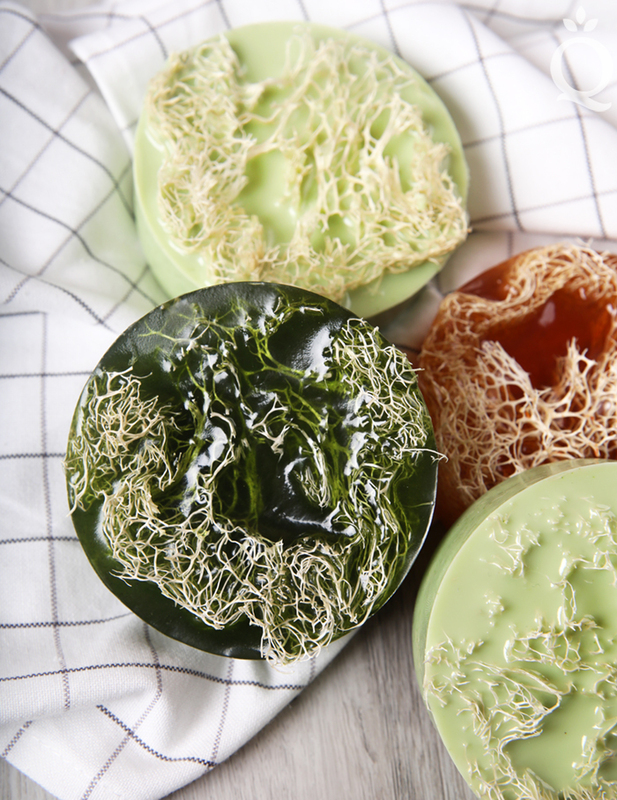 Can you use loofa sponges in CP soap also or will the high PH cause it to disintegrate? 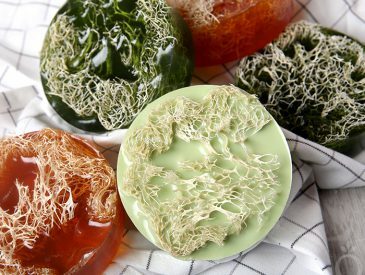 You can use loofah in cold process soap as well. You can place the loofah into the mold first like we did here, or pour the soap in and then add the sponge. Make sure the soap is at a thin trace. I saw a soap like this at a gift shop, and that started me thinking about making my own soap. When I stumbled across the Soap Queen, I knew I had to try. I am loving it. 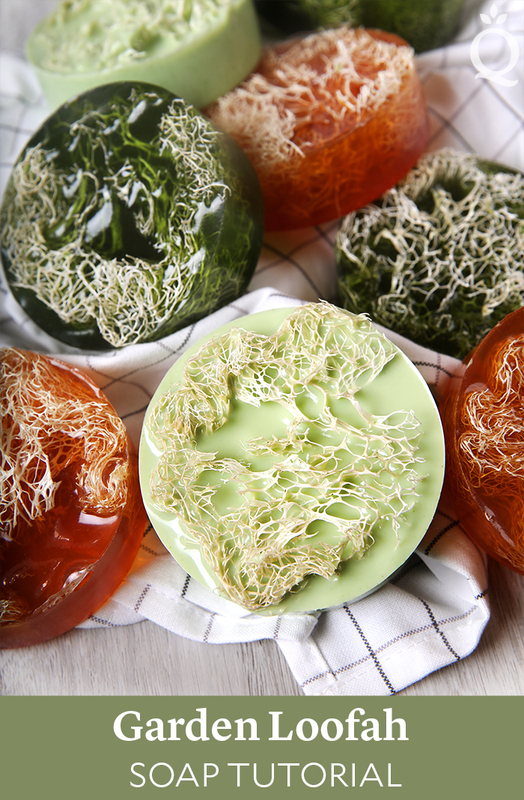 Adding loofa sponges is just scratching the surface of what you can add to soap. I just made a soap using Bramble Berry’s new bee pollen and beeswax and honey from our own hives. Thank you for getting me started. Thank you so much for leaving this comment, it really means a lot to us. We want everyone to experience how fun handmade soap is to make and how wonderful it feels on the skin. Once it’s in the shower, it will likely form dew because it’s humid in there. The good news is that glycerin will attract moisture to your skin and keep it feeling hydrated.